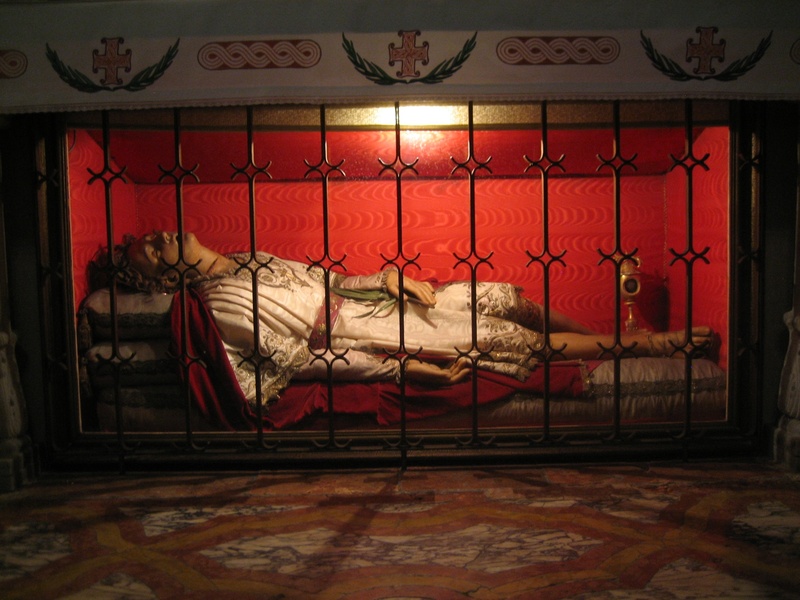 The incorrupt body of Saint Silvan (pictured here) is located in the Church of Saint Blaise in Dubrovnik, Croatia. A number of Silvans have been canonized as saints, and it is unclear which Saint Silvan is entombed at the Church of Saint Blaise. Most sources claim the Saint Silvan at Dubrovnik was martyred in the 4th century — a gruesome scar on his neck suggests the manner of his martyrdom — which may indicate he was Saint Silvanus, Bishop of Emesa, Phoenicia, martyred c. 311. Other Saint Silvans died in ways (e.g., thrown off a cliff or of natural causes) or at an age suggesting they cannot be the Saint Silvan at Dubrovnik. Still others are believed to be buried elsewhere (e.g., Saint Silvin or Silvinus, who died in Auchy-lès-Hesdin and is likely buried at the Abbaye de bénédictins d’Auchy). One other Silvanus of note should be mentioned, although his body is probably not the one enshrined in Dubrovnik. A Silvanus, also called Silas, appears in chapter XV of the Acts of the Apostles when the Apostles and elders chose delegates to send to Antioch with Paul and Barnabas. They chose Judas and Silas, “both leading men in the brotherhood.” Saint Paul later refers to Silas by his full name, Silvanus, in two of his letters to the Thessalonians. According to Butler’s Lives of the Saints, “Nothing more is known of him, but traditionally he lived the rest of his life in Europe and died, as the martyrology says, in Macedonia.” Saint Silas may also have been the same Silas whom Saint Peter mentions in 1 Peter 5:12.